Extreme Zombies offers an alternative to the typical ghoulish and scary zombies we’re used to, bringing them into the 21st century as funny, trendy and sporty monsters of the night! Originally launched a decade ago this uniquely successful boys graphic brand has, over the years, secured many great licensees worldwide. 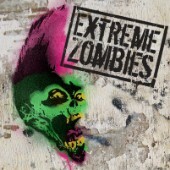 With its edgy graphics and sense of humour, Extreme Zombies is the ideal property for the challenging 8+ boys market.